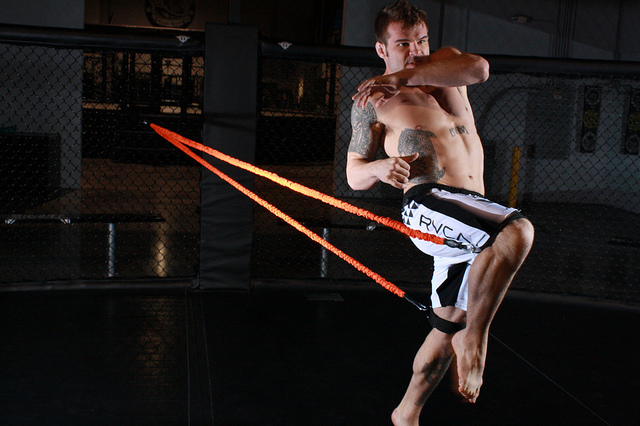 Although there are other viable options Bodylastics and Black Mountain Products dominate in terms of the popularity of their tube-style resistance bands. Beyond offering good quality at a fair price, another significant contributing factor is that both companies offer sets containing everything you need. Right out of the box it’s enough to deeply explore the possibilities of exercising with resistance bands. 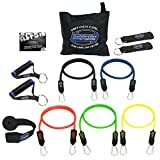 Either brand offers sets with modular handles, resistance bands for all fitness levels, ankle straps, and a door anchor. 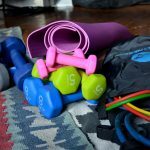 Bodylastics offers a greater number of products for different needs from the most basic 10-piece set to a massive 31-piece set. Black Mountain Products has expanded their offerings, however their ultimate set isn’t nearly as extensive. Black Mountain includes 7 resistance bands compared to 14 in Bodylastics’ Mega Resistance Bands Set. The parts are similar between the companies. It’s the details that set them apart. Bodylastics uses a patented technology called “snap guard.” This is an inner braided safety cord used to prevent over-stretching. This protects you if the band snaps. 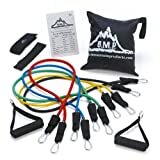 Although Black Mountain Products bands don’t have this, their product is well reviewed and durable. Bodylastics handles have a slip-resistant pattern etched into the foam. In comparison Black Mountain Products handles have a plain foam grip. In use the difference isn’t considerable but Bodylastics has the edge here. One area where Black Mountain Products has their biggest competitor beat is value. Bodylastics may offer a slightly more polished product overall but it also sells for a bit more. The Black Mountain Products set currently selling for about $31. It’s tough to beat at that price. You can’t go wrong with either company. However if you’re willing to pay just a little more Bodylastics is the best choice. Black Mountain Products provides an unbeatable value so if that appeals to you more you won’t be disappointed with what you get. 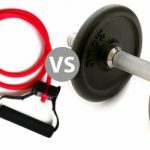 Also check out the comparison of the best resistance bands for specs, warranty info, etc.